So VMworld 2015 US kicks off this weekend, and with more than 20,000 people expected to attend, it looks like it’ll be another packed out couple of days in San Fran….. again, unfortunately due to my location, I’m scheduled to head to VMworld Europe, which means all the juicy stuff will already be announced come Barcelona in October! Although that could also be a benefit as I can tailor my schedule to try and learn more about those announcements! The theme this year is “Ready for Any” an interesting tagline which I guess tries to emphasise how VMware have positioned themselves as a company with a portfolio that can accommodate anyone and anything….. Any Application, Any Device, Any Cloud! The great thing about VMworld (and I guess like any other expo) is the event brings together all the Management teams, Subject Matter Experts (SMEs), IT professionals, End Users, Partners, etc, and lets them mingle together and learn about the latest and greatest within Virtualisation and Cloud Technology. There’s something for everyone – you get to hear where the direction of VMware is heading during the General Sessions with Pat Gelsinger and Carl Eschenbach, learn about shaping your IT strategy at thought-leadership breakout sessions, all the way to understanding what’s under the hood in Advanced technical sessions and Hands-on-Labs (HOLs). 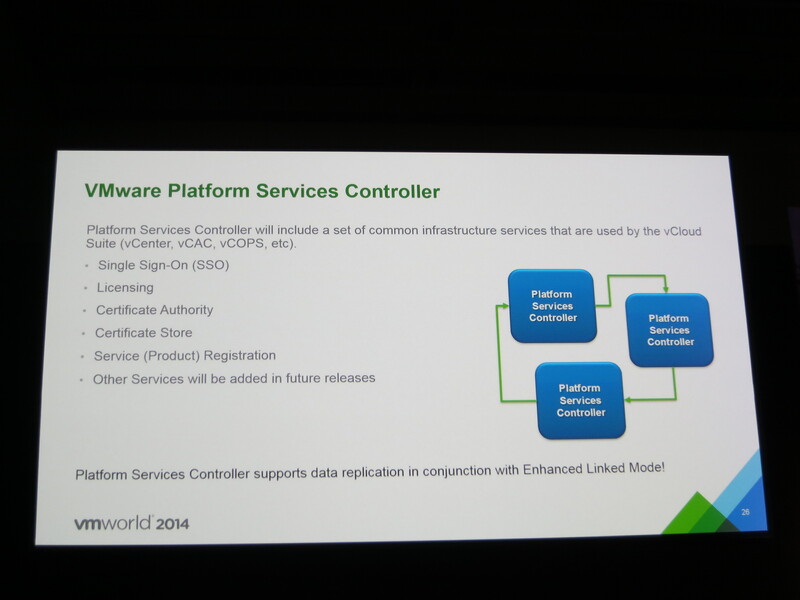 In addition, the Solution Exchange lets attendees check out what VMware partners have to offer! This year there’s a new Cloud Native Applications track (in addition to the usual SDDC, EUC, and Hybrid Cloud) and I guess this is a key focus for VMware as they see DevOps becoming a core influencer in the modern IT organisation. 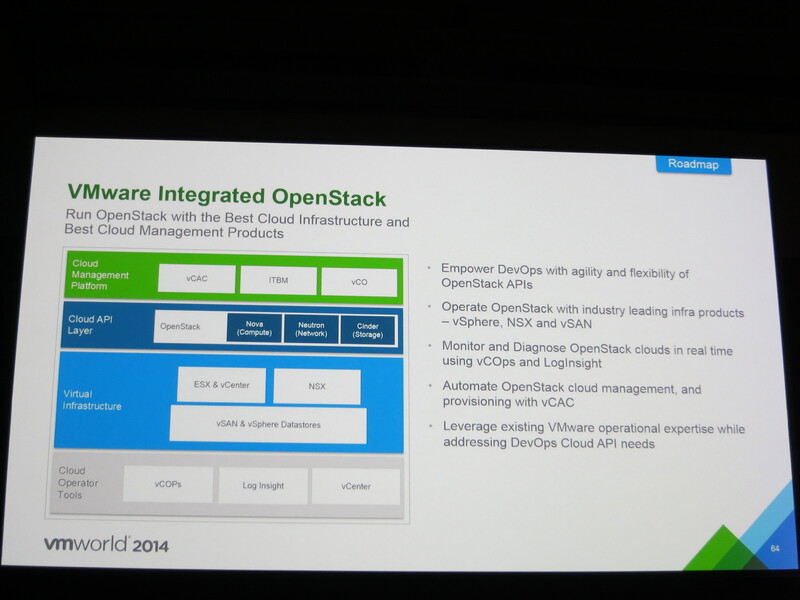 VMware are looking to show that there are tools available within their portfolio to help DevOps teams utilise the VMware stack for Continuous Delivery, both on-prem and off-prem (CloudOps). There’s even a dedicated 3-day DevOps program at the US event (unfortunately not at the Europe event). 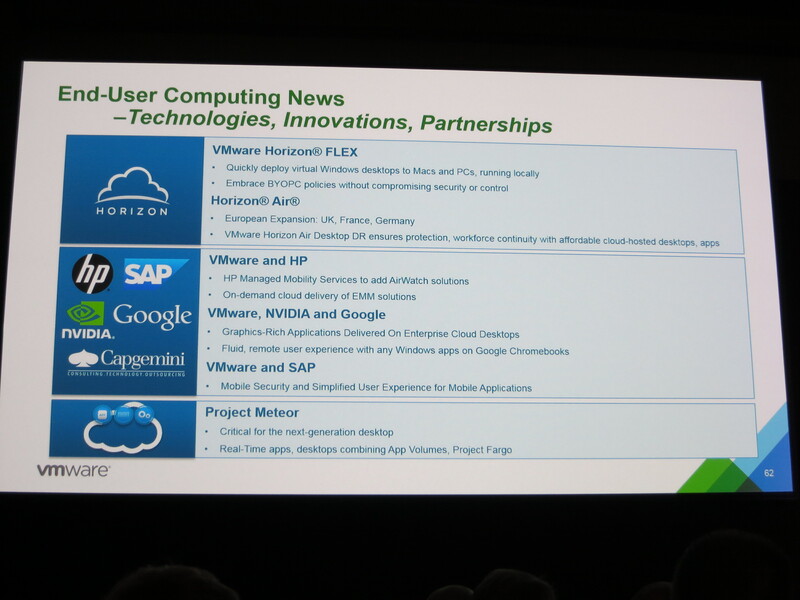 Apart from a huge DevOps drive, there seems to be quite a number of sessions on vRealize, NSX and Virtual SAN – and I’m guessing these are the key focus areas of revenue for VMware in the upcoming year. 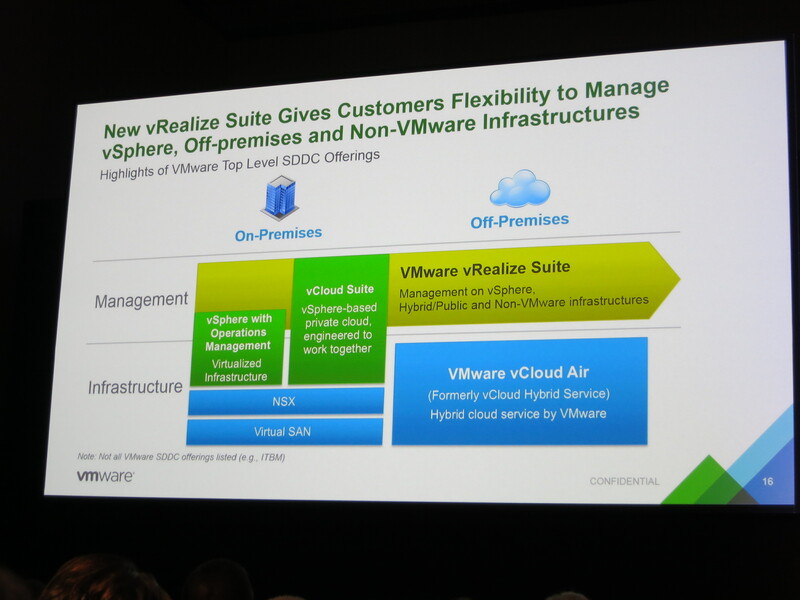 VMware are aware their vSphere product line has matured and are trying to transition their customers onto other products. In addition there are a number of Expert Led Workshops (ELW) available to schedule (similar to the Hands-on-Lab sessions but with an Expert on hand to field questions). However, these sessions are extremely popular and most are full already! So having scrolled through the hundreds of sessions that are available at both the US and Europe event, what has caught my eye? 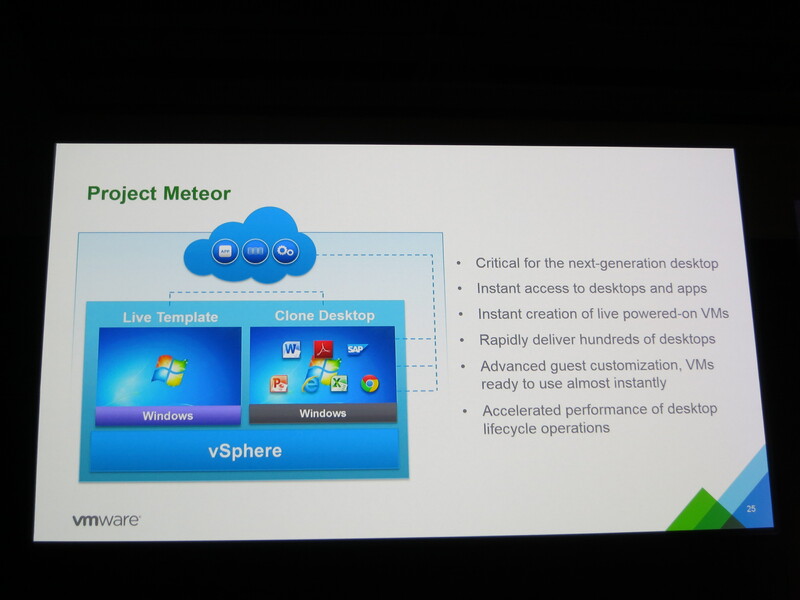 It looks to be an amalgamation of Project Meteor and Project Fargo – which were showcased last year at VMworld 2014, allowing Just In Time (JIT) desktop deployment (VM-forking technique which is basically Instant Cloning of VMs) – and AppVolumes which delivers applications Just in Time. All sitting on top of a HCIA like EVO:RAIL/EVO:RACK. It also looks like they will tie in User Environment Management features from their recent Immidio acquisition. EVO:RAIL 2.0 – There are a number of sessions around Hyperconverged Infrastructure, how to position it within the market and also the Business Advantages around a HCI stack. Building on from the launch of EVO:RAIL last year comes the announcement of version 2.0 which will utilise all the goodness from vSphere 6.0 and VSAN 6.0 – a much welcomed upgrade! It will be interesting to see whether there will be discussions around whether a multi-site EVO:RAIL cluster will be possible (see comments under VSAN). I’m really interested to learn about the underlying architecture – it’s obviously going to be a framework with several vendors becoming “qualified partners”. I know for a fact that EMC will be releasing a EVO:RACK solution (potentially EMC VxRack 1034). 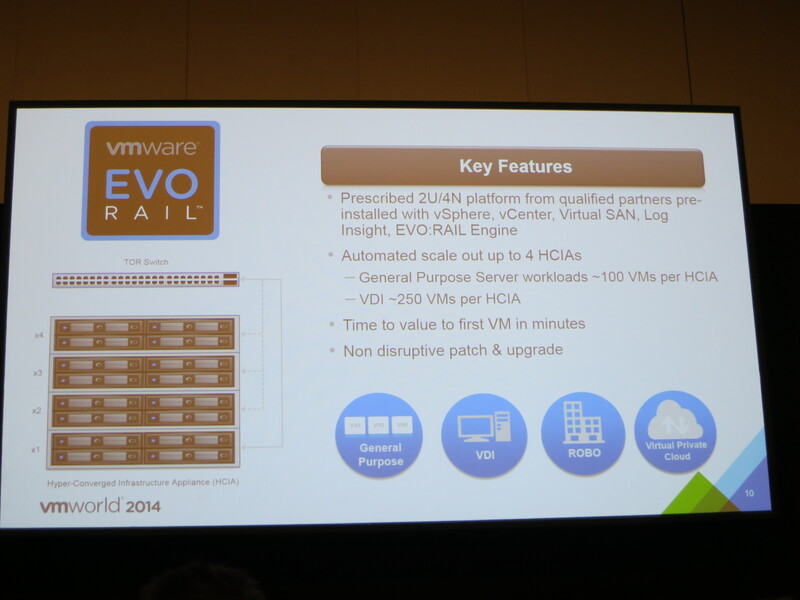 What made EVO:RAIL so attractive was the software – the ease of deploying an appliance and even scaling out the HCIA cluster. What put a lot of people off was the limitations on hardware and the lack of choice you got. I’m hoping EVO:RACK has an intelligent software stack that exceeds EVO:RAIL plus the flexibility to support a broad range of hardware combinations. In my opinion, the perfect world would see the software working on any underlying hardware (no matter how many CPUs, memory or storage is presented) – it should be clever enough to adapt the automation workflows to the hardware! DevOps/Cloud Native Apps – I’m not going to try and pretend I know loads about DevOps, so all I’m going to do is re-iterate how VMware sees this as the next key area in IT and hence why there is a dedicated track on Cloud Native Applications. There are sessions on how applications are developed and operated (DevOps/CloudOps), how they’re architected (microservices and 12-factor apps), and how they’re deployed (Docker and containers). 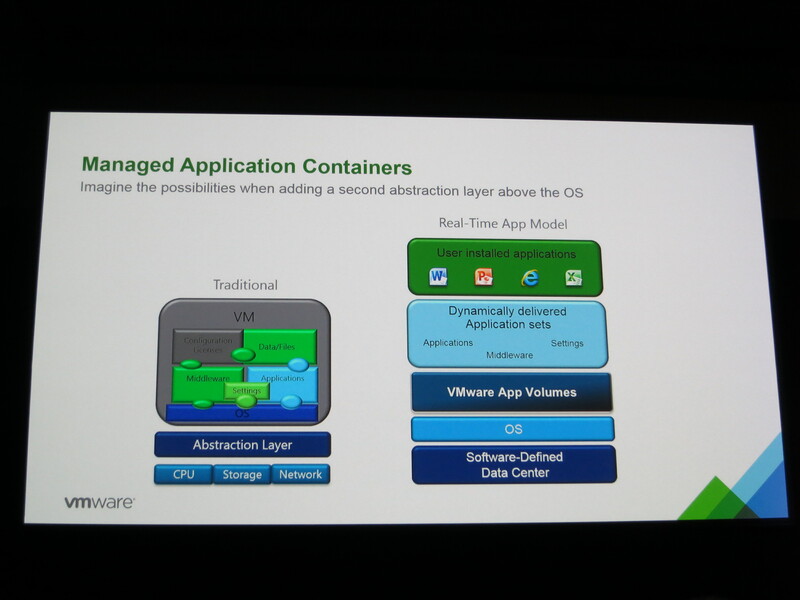 Expect some deep dives into the likes of Project Photon & Lightwave – key to VMware’s take on Microservice (which is a way of designing applications as a suite of small services, running independently of each other), and sessions on Docker integration and Containers. NSX – NSX has slowly trundled along since launch and NSX 6.1 introduced the world to Micro-segmentation (or at least enhanced its capabilities for it), something that has resonated well with end-users – the ability to logically divide the data centre into distinct security segments based on individual workloads and define policies/services for each segment. Checkpoint, F5 and Palo Alto (to name a few) all have technical sessions running at VMworld this year, building on their integration with NSX in securing the virtual environment, and I see that as a key selling point of NSX – the whole securing Easty-Westy traffic rather than just on the perimeter, and the ability for network security profiles to move with the VM (ie if you vMotion it, or even replicate it to another site). 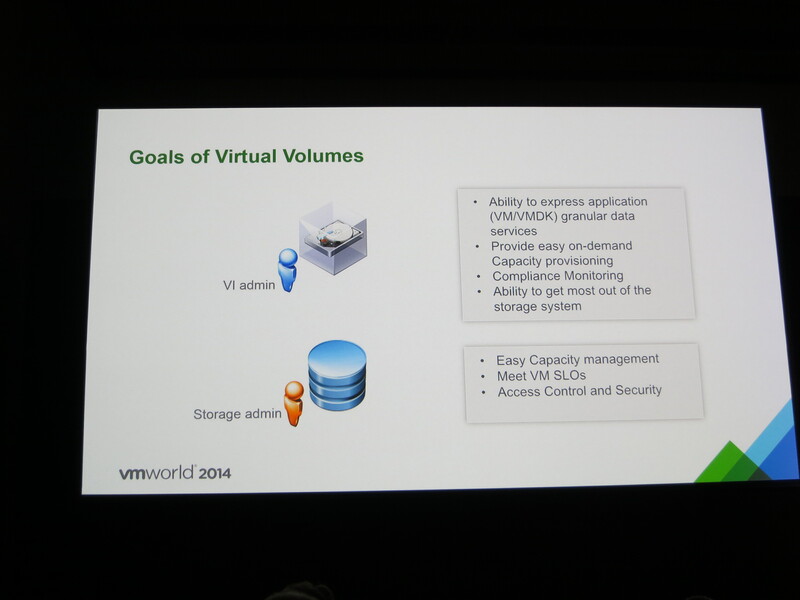 Virtual SAN / vVOLs – As with NSX, Software-Defined Storage is another key part of VMware’s portfolio in trying to empower IT-as-a-Service (the whole SDDC solution). There are a number of sessions discussing the relationship SDS has with Converged Infrastructures. 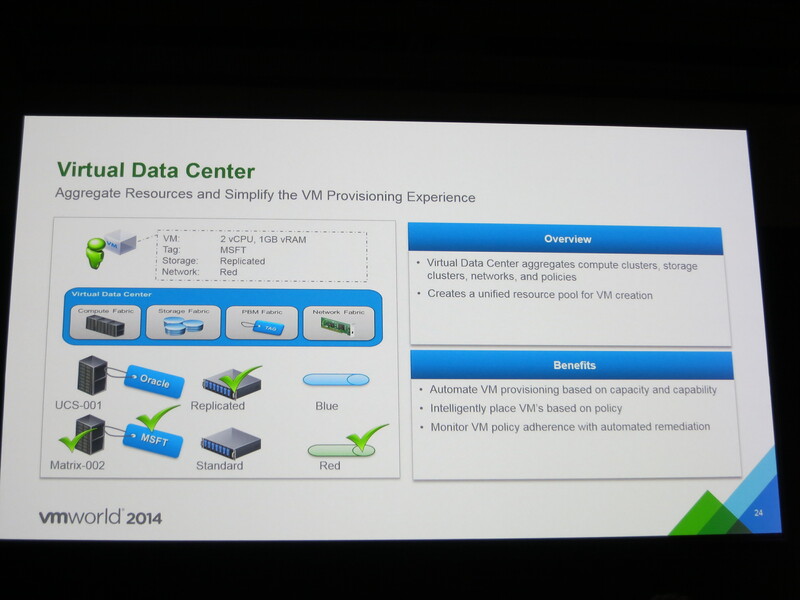 Obviously with the launch of VSAN 6.0, there are a number of interesting deep-dive technical sessions – Especially the one being run by Duncan Epping and Rawlinson Rivera on “Building a Stretched Cluster with Virtual SAN”. With the addition of the fault domain feature in VSAN, this leads to the question regarding whether you could stretch a VSAN cluster across multiple sites (assuming network is flat and low latency)… and that leads to the interesting discussion about what you could potentially do with EVO:RAIL! Since VVOLs was launched, the storage vendors have been slow to get their products to market – but understandably as the whole SAN concept is re-written with this technology. However, there are a lot more vendor sessions this year – and the “VVOLs Technical Panel” will be an interesting session where we should hear from all the storage vendors and how it’s been implemented in their arrays! Whilst I’ve mentioned some sessions available at VMworld US, unfortunately only a handful of them ever make it over to Barcelona. 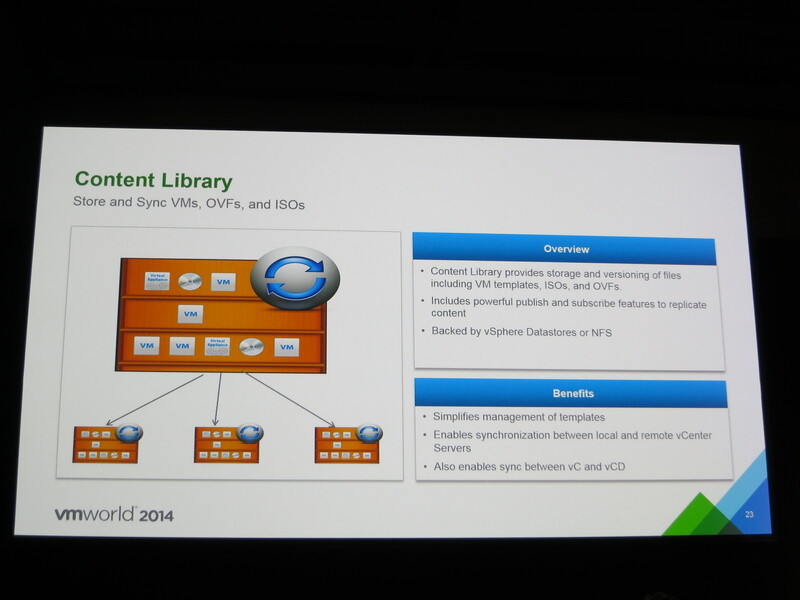 So here are some sessions at VMworld Europe that I think would be worth attending! It’s also worth mentioning that these are the sessions that have jumped out at me on my first few passes of the Content Catalog, I’ve yet to go over all 375 sessions in detail! CTO6453 – The Future of Software-Defined Storage – What does it look like in 3 years time?